Sign up to Dry July Australia 2018 and raise funds for Calvary Mater Newcastle Hospital. Calvary Mater Newcastle is the major cancer care centre for the Hunter New England Local Health District, delivering more than 370,000 occasions of outpatient services and in excess of 17,000 inpatient treatments per year. As the region’s only public oncology hospital, we treat a lot of patients who travel a great distance to have their treatment. All funds raised through Dry July go to our oncology services and assist in providing items of comfort and care for patients and their families. 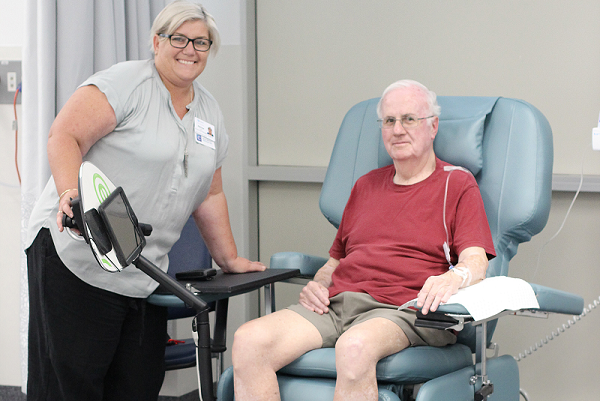 The Calvary Mater Newcastle Day Treatment Centre is pleased to be able to provide our patients with a little more comfort with the procurement of two new chemotherapy treatment chairs thanks to Dry July fundraising. Not only do the chairs reduce the risk of pressure injuries for those patients receiving long treatments but they provide a place where patients can charge personal devices and a platform to support them. The Calvary Mater Newcastle Occupational Therapy Department offers all patients receiving oncology or haematology treatment at the hospital access to a comprehensive loan pool of over 800 items. This pool is stocked with 80 different styles of equipment that may be prescribed based on the individual patient’s needs and can assist patients to live a more comfortable life through their cancer treatment. The provision of often simple assistive aids like wheelchairs, dressing sticks, over bed tables, shower chairs, raised toilet seats and bath boards, for short term loan can allow patients to be discharged home or into care, and complete activities of daily living. Patients are better able to manage their illness with specific loan items and often comment on the huge benefits of this service. One family member, when trialling items for her 94 year old father said, “Thank you for the cushion for Dad… he is finding the footstool and cushion to be very comfortable with the skin grafts on his legs”. Quotes of gratitude like this are very common and show how much comfort the loan items can provide the patient as well as their concerned families. Thanks to 2018 Dry July funding, the team have purchased new innovative products to add to the pool. New advances in design have seen greater weight capacities introduced in seating, bathroom and showers aids, and improved technologies in pressure care materials, like cushions and mattress overlays, now give greater patient comfort and support than ever before. It is wonderful to be able to provide such a broad range of equipment to over 300 patients every year, a completely free service that is only made possible by the generous donations of Dry Julyers. 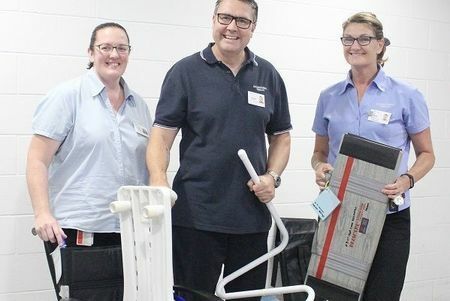 This invaluable funding is directly responsible for purchasing and updating the equipment as it needs replacing, and allows us to replenish our stock of commodes, portable ramps, raised toilet seats and many other items that reduce the risk of pressure injuries and lessen the burdens of falls. The Calvary Mater Newcastle Day Treatment Centre was able to purchase a new blanket warmer thanks to funding from Dry July. Marissa Ledlin, Nurse Unit Manager of the Day Treatment says, “The centre’s new blanket warmer provides more than just the warm fuzzies! Some of the side effects of chemotherapy and scalp cooling mean that to help relieve patient’s symptoms we need to warm our patients up. 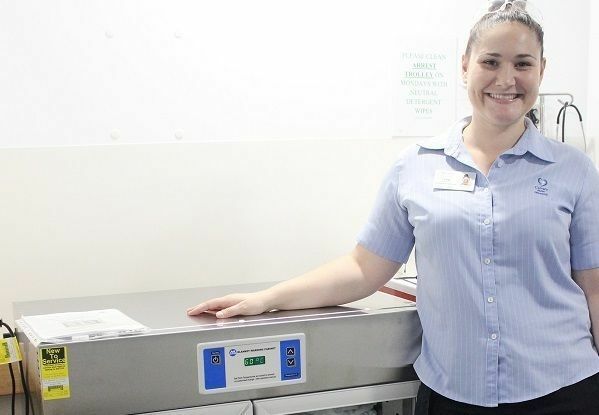 Having a blanket warmer close by means that staff are not required to source warm blankets from other departments, thereby making patients more comfortable quicker and saving the nurses precious time. Melanoma is the fourth most common cancer in males and the third in females in NSW. The Calvary Mater Newcastle Melanoma Unit provides care to patients with primary, metastatic melanoma and patients at high risk of developing melanoma. Thanks to the support of Dry July, the hospital’s Melanoma Unit was able to purchase the latest handrail scales, providing increased safety for its patients. The handrail provides the patient with a safe handhold before during and after weighing, the platform is also non slip and can accommodate patients weighing up to 300kgs. 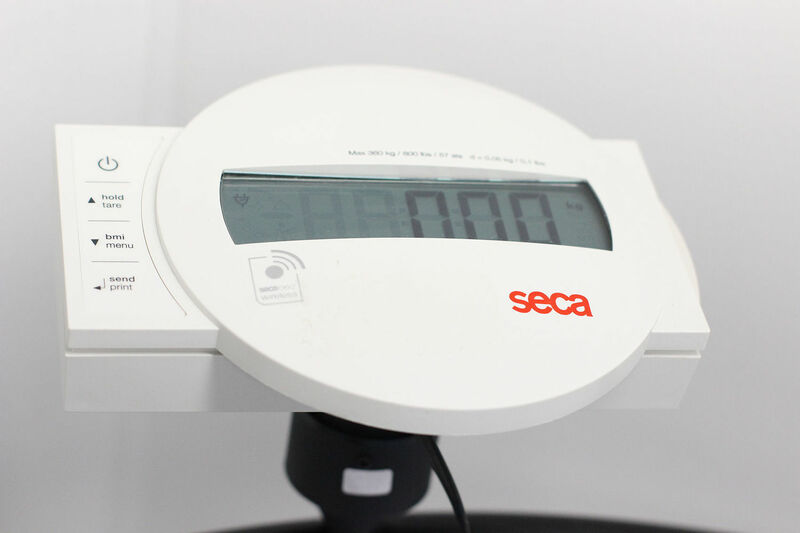 As the scales are on wheels they provide staff and patients with the convenience of being able to easily move them from one clinic room to another. 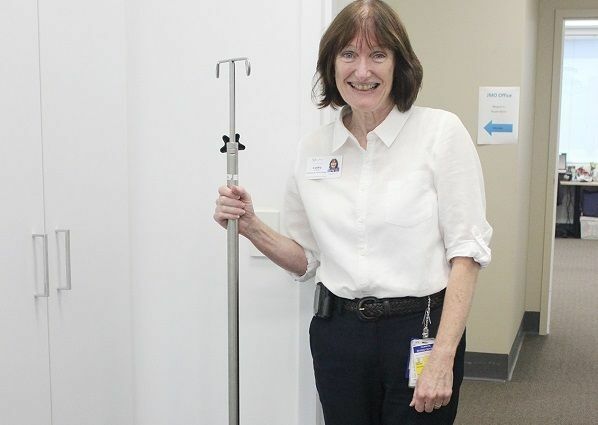 Thanks to Dry July generosity the hospital’s Dietetics Department was able to purchase 12 new IV poles. These poles are used by Head and Neck Cancer patients to assist with tube feeding at home while they receive and recover from treatment. Patient, Peter Amos, said, "I owe a debt of gratitude to all those dedicated Mater staff that make available the IV posts for cancer patients. Having this equipment available at home has made it easier to manage both food and water intake, making it easier to cope during my cancer journey." Thank you to all of our Supporters and to the Dry July Foundation for making all of these projects possible. The Calvary Mater Newcastle Melanoma Unit is a specialist centre for patients with a diagnosis of melanoma, where patients undergo reviews of melanoma and treatment is provided. Previously, the patient waiting room was old, tired and required changes to be made to enhance its functionality. 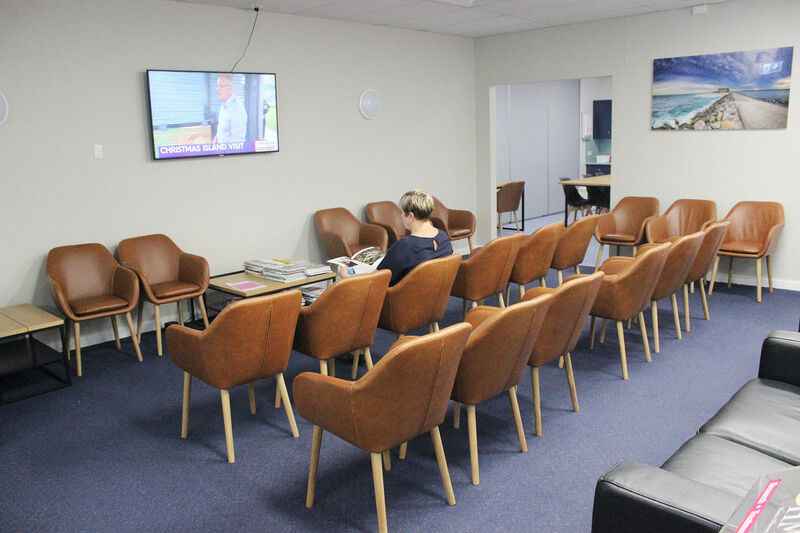 Thanks to the funds raised by participants in Dry July 2018, funding has enabled the waiting room to be refurbished with new paint, chairs, lounges, a television, brochure holder and coffee table, which provide comfort, privacy and critical information, in a supportive environment that assists with patient’s transition through the care experience. The unit’s patient servery has also been refurbished by enlarging the doorway to make the room more accessible. 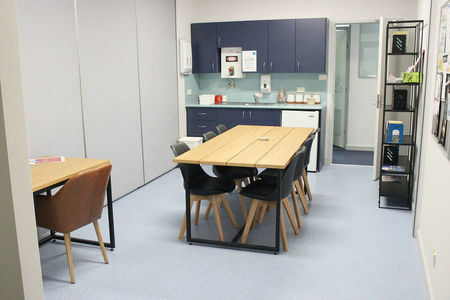 A new dining table, chairs, bookcase and desk have guaranteed this space is comfortable whilst waiting having a coffee, filling in paper work or facilitating patients to work at the desk if they are away from their place of employment. Thank you to all of our supporters and to the Dry July Foundation - our patients love having such a lovely inviting area to wait. Thanks to Dry July Funding, new hats, turbans and scarves were able to be purchased for oncology patients receiving treatment at Calvary Mater Newcastle. Both men and women report hair loss as one of the side effects they fear most after being diagnosed with cancer. For many, hair loss is a defining factor that they have cancer. 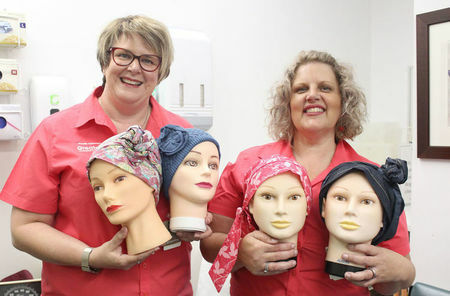 Helen Moore, Clinical Nurse Consultant and McGrath Breast Care Nurse at Calvary Mater Newcastle, says, “Covering your head as your hair falls out is a purely personal decision. For many people, hair is associated with personal identity and health, so they choose to maintain that look by wearing wigs, hats and scarves. $111,950 total funding was awarded to the Calvary Mater for projects including $20,000 for chemotherapy chairs and a blanket warmer for the day treatment unit. This included special 'matched funding' for one Dry July-er, Emily Taylor, who wanted to raise funds for the unit in support of her sister who is receiving treatment there. The new chairs include silica upholstery and a multimedia platform that will increase comfort for the patients having long treatments (6-8 hours). The chairs reduce the risk of pressure injury, provide a place for personal entertainment to prevent boredom and a USB port to charge patients personal devices. 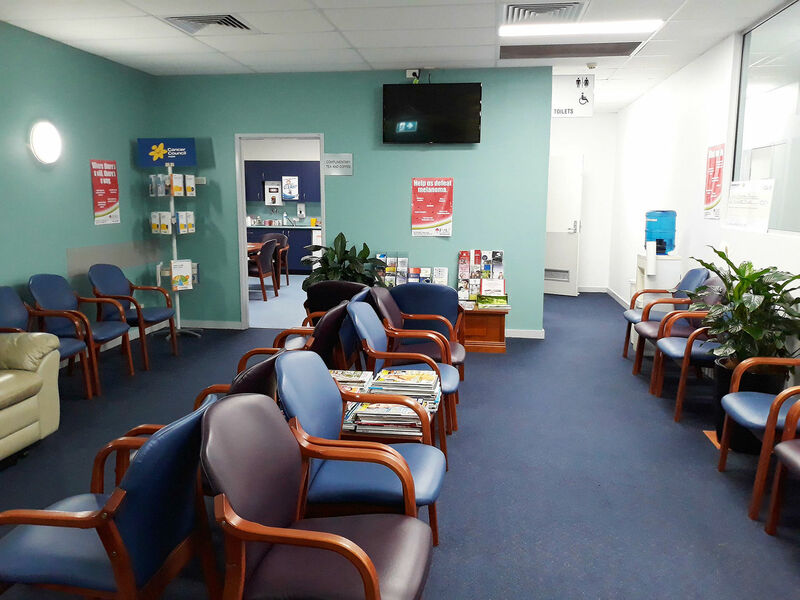 $30,000 was awarded for the refurbishment of the waiting room in the melanoma unit. The refurbishment will include sofas, comfortable chairs, bariatric chairs, coffee table, iPads etc. Patients will be able to wait in comfort for appointments and treatments. 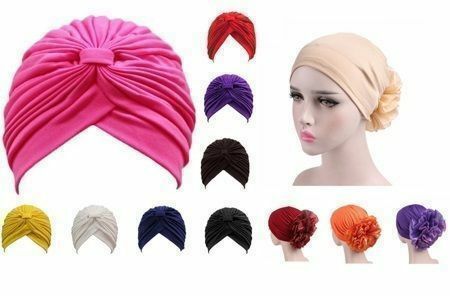 The remaining funds will be used to purchase Scarves and Turbans for oncology patients; various pieces of equipment and to produce videos to provide education and information to patients, carers and the public about cancer treatment at the hospital.